So you’ve finally had that old acrylic shower enclosure unit cut out and replaced with a luxurious tiled shower and it is GORGEOUS! The first shower in it will be absolutely BLISSFUL…except for one thing….that annoyingly gross shower curtain blowing in on you! All this amazing tile and design work, and it’s covered up by a horrendous plastic curtain that doesn’t do its job all that well anyways. Thankfully the professionals at H.J. Martin and Son can help you thoroughly enjoy your new shower whether you are using it or simply admiring it. Our custom heavy-glass enclosures provide form and function by beautifully containing water and warmth in your shower. Now when we say “custom” we truly mean custom. Our professional designers will ask all the right questions and present you with great ideas and options for your personal shower enclosure. Our experienced shower door technician will skillfully measure and install your glass enclosure with your preferences all in mind. Glass options include standard 3/8” thick clear glass, low iron glass for an ultra clear white affect, “steam,” “rain” and a variety of other textures. Optional glass applications such as Showerguard and Clearshield will help make your new enclosure easy to maintain. Metal hardware options are equally broad, allowing you to coordinate to the faucets and cabinet hardware in your bathroom. Choose from a variety of durable handle, towel bar, hook and hinge styles and colors. Whether you need a simple frameless door with a sleek back to back C-pull, or a more complicated steam shower enclosure complete with operating transom window and full seals, we will design, furnish and install the right enclosure for you. If you are in the beginning stages of your bathroom remodeling project, be sure to enlist the help of our design team early on. 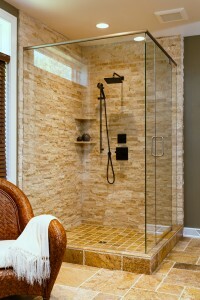 We can assist not only with the shower tile selection and layout, but also in the overall shower configuration. Would you prefer a more private enclosed shower with a cased opening and dropped ceiling requiring a door only? Or maybe you like the open airy feel that full glass panels and a door give you? How about somewhere in between? Partial tile walls and glass panels give you privacy and let lots of light into a shower while giving you more options for hiding those recessed niches or tucking away a full bench. Heavy glass enclosures are not only for walk in showers though. French doors that open in both directions or a fixed panel and door are also great options for tiled tub enclosures allowing children and pets to be bathed with ease while showcasing beautiful tile work. Maintaining your new glass enclosure should not be a source of concern as daily toweling or squeegeeing will prevent hard water deposits from collecting on the glass. Simply charge the last family member showering for the day with the task and be sure to have a good fan with a timer installed to help dry out your shower completely even after the bathroom is vacated. Use a moist, soft micro fiber cloth for routine cleaning and gently remove any water spots or cumulated soap scum. Steer clear of harsh chemicals and abrasive cleaning pads as they will damage the glass and metal over time. Did you know that a light in your shower not only helps you to see better while showering, but it also discourages the growth of mold and mildew? Be sure to ask your contractor to review all the options available to you for your space and discuss the details with your H.J. Martin and Son designer. Find inspiration by visiting our website to see gorgeous H.J. Martin and Son shower enclosures and meet our designers and shower door technician. Certain technical limitations may apply to your shower area, so planning the entire project in advance of having the tile work done is an essential part of getting exactly what you want. Stop in today to chat with one of our designers about how we can give you the shower enclosure of your dreams.